What do You, your cat, a cute backup singer and dread K'tulu on lead zither have in common? They're in your band! 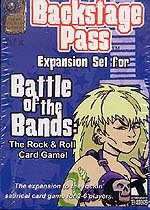 New characters, instruments, reputations and more for you Battle of the Bands card game! You're a star, so let's jam!